If it has to hold sheet metal, Pen Engineering is offering PEM SFN, a ‘spinning flare nut’ that can be made captive in thin metal. If two sheet metal assemblies have to be held together, it can be paired with a self-clinching stud in the other sheet (see diagram) “eliminating all loose fasteners, including flange nuts, in attachment applications,” said the firm. .
PEM SFN install in steel, stainless steel, or aluminium sheets of any hardness and as thin as 1mm. They are available in metric thread sizes M5, M6, and M8. 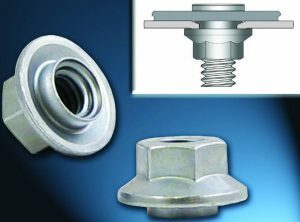 Permanent installation is accomplished by inserting the nut into a properly sized, pre-punched, pre-embossed mounting hole in a metal sheet and then applying sufficient squeezing force to flare the fastener’s shank. When installed, the part will appear identical to a standard flanged hex nut above the sheet and will remain flush on the other side (through pre-embossing).